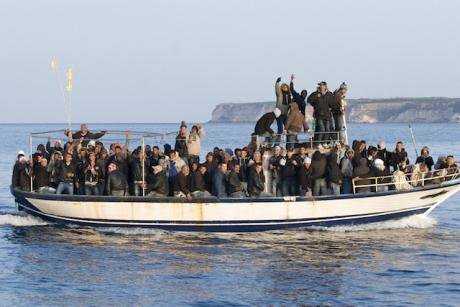 Boat with about 120 migrants on board coming from Tunisia, that arrived on the coasts of Sicily in March, 2012. Cremaschi/ Associated Press. All rights reserved. Beyond the legal argument, this case, which was minutely documented by Alarm Phone, illustrates the politicisation of the responsibility for allocating a port of safety (POS) in the past months in the central Med. To be brought to safety, it is no longer enough to endure the crossing in a flimsy dingy beyond Libyan territorial waters and hope to be rescued by a bigger vessel. Now, people can either be ‘legally’ pushed back to Libya (a documented 'hell' for migrants) if the Maritime Rescue Coordination Center (MRCC) in Rome calls the Joint Rescue Coordination Centre (JRCC) in Tripoli and the Libyan Coast Guard (LCG) manages to conduct the rescue. Or, as in this recent development, people have to endure being at sea for another two weeks, left in the dark as to when, where and if they will be allowed to disembark. People have to endure being at sea for another two weeks, left in the dark as to when, where and if they will be allowed to disembark. However, in the current political configuration in the central Mediterranean, and EU-rope more generally, the confusion around the legal obligations of states for rescue at sea, added to the securitized discourse around migration, have turned the definition of rescue and what constitutes a port of safety into a discursive battleground which far exceeds black letter law. The two weeks’ ordeal of the Sarost 5 is the perfect illustration of this development. Whilst the vessel was stuck at sea, different parties with differing interests and power positions, argued over where people should be allowed to disembark. Whilst the vessel was stuck at sea, different parties with differing interests and power positions, argued over where people should be allowed to disembark. Countering Malta and the UNHCR’s claims, human rights defenders and activist groups such as the Alarm Phone, the Forum Tunisien des Droits Economiques et Sociaux and Euromed Rights said that Tunisia could not be considered a port of safety due to the lack of legislation on asylum and the documented struggle that asylum seekers face there. With no access to housing or social protection for refugees in Tunisia, it is clear that there was a high likelihood that basic rights of potential asylum seekers would not be fulfilled. Further, Tunisia’s ongoing financial crisis and the fact that in the first quarter of 2018 the largest group of border crossers arriving in Italy were from Tunisia, raised questions as to the country’s capacities to receive people in a dignified way. Although a dignified life for migrants in Europe is far fromguaranteed, many of the people of the Sarost 5 have family in Europe and had risked their lives to reach its shores; for most, the prospect of being brought to Tunisia was terrifying for the simple fact that they had no support structures there, let alone that they feared they would be sent back to their countries of origin. Tunisia’s ongoing financial crisis and the fact that in the first quarter of 2018 the largest group of border crossers arriving in Italy were from Tunisia, raised questions as to the country’s capacities to receive people in a dignified way.